American Testament: The Book of Mormon: A Fresh Perspective on Cahokia Mounds: Mayans in Our Midst? A Fresh Perspective on Cahokia Mounds: Mayans in Our Midst? Since I visited Cahokia Mounds in 2012, I've been fascinated by many parallels between what I witnessed as a missionary in Guatemala and as a tourist in the Yucatan and what I saw at Cahokia. 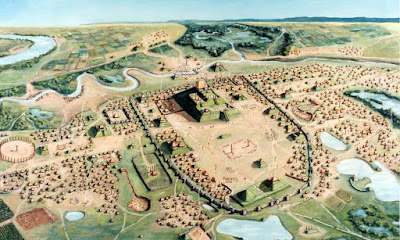 Check out this article on Cahokia Mounds. It goes into how the Cahokia civilization just up and abandoned their urban project, and for a lot of the same reasons for which Mayan civilizations abandoned their urban centers and lifestyles. ...it appears the Mississippians may have conducted ritual human sacrifices, judging by what appears to be hundreds of people, mostly young women, buried in these mass graves. Some were likely strangled; others possibly died of bloodletting. Four men were found with their heads and hands cut off; another burial pit had mostly males who had been clubbed to death. Did post-Book of Mormon era Yucatecan Mayans travel northward across the Gulf of Mexico, or along its Western coast, to the Mississippi river and influence or even directly establish the Mississippian cultures, urban centers, and places and methods of worship and sacrifice?